The Support Continues: Laughing for Babz! Never let it be said that the Vancouver arts community doesn’t take care of its own. In yet another addition to the fundraising drive to facilitate Babz Chula’s urgent and progressive cancer treatments, the One Night Stand comedy night at Gastown’s Lyric School of Acting will be donating all the proceeds from this Saturday’s show to the Babz Chula Society. One Night Stand is one of the best kept secrets of the city, a once-a-month stand-up jam that routinely features some of the best comic talent in the city, and if you don’t yet know, that’s saying something. The comedians that are appearing on our too-few stages right now are the best I’ve seen in years, we are on the cusp of a stand-up renaissance right now. 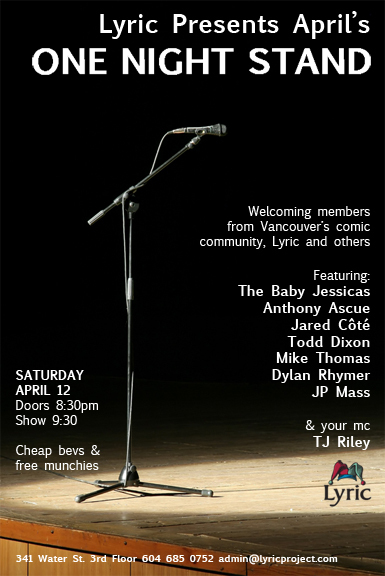 Head on down to Lyric on Saturday the 12th to hear what I’m talking about, but only if you like laughing yourself stupid. And donating a few bucks to take care of someone very important.